Linda Stevens Moyer is an accomplished artist but unfortunately this book is slightly misleading. 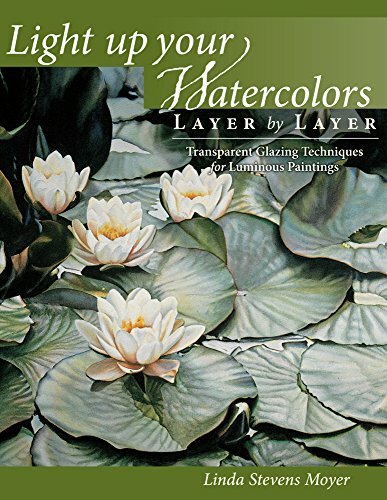 Title of the book suggests that it's going to be dedicated to watercolour layering or glazing techniques but the coverage provided for those techniques just makes up a small portion of the book. The bulk of the book covers basic watercolour techniques for beginners. There are a lot of watercolour books that deal with beginner techniques so this book offers nothing new in that area. Right at the back of the book are two long demonstrations and some mini demonstrations. The long demonstrations are terrific with step by step instructions and pictures. However, there are only two of these in the whole book. The mini demonstrations are less useful because they are just limited to 3-4 steps of instructions and one painting split into different stages of progress. This book is for beginners. Having said that, it only teaches you the basic techniques. It doesn't teach you how to compose or draw. So you will need basic drawing stills to get the most out of the book. For intermediate artists or advanced artist looking to learn glazing, you are likely to be disappointed by the limited amount of content devoted to that technique. I will recommend you check out Watercolor in Motion: How to Create Powerful Paintings Step by Step instead.